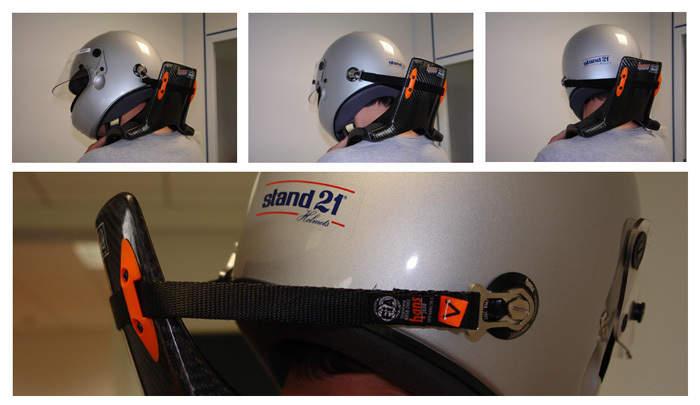 Following an intense R&D test period to optimize it, IVOS, the brand new Stand 21 helmet is now available. 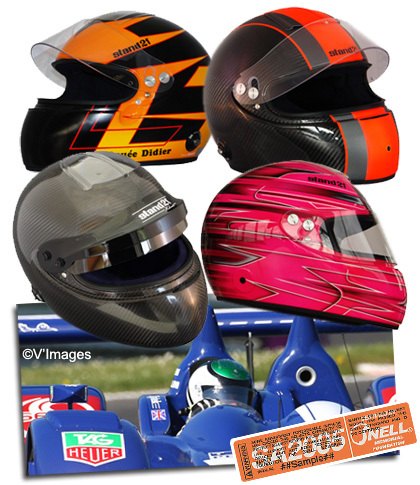 SNELL SA 2005 approved as any other Stand 21 helmet and already looking at the SNELL SA 2010 standard, this new generation helmet reaches optimum comfort and safety performance never seen before in its price category. Forget about your past references and come to test IVOS engineered by Stand 21! Limited to 500 units on purpose for 2008, and with many already booked, be quick to get yours! As always with Stand 21 products, IVOS is fully customizable and made-to-measure. Stand 21 is also the only manufacturer offering a size 65. 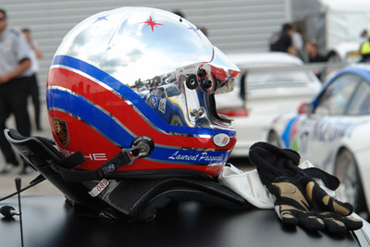 This helmet is delivered with a raw carbon shell without any varnish nor paint for a weight of 1,300 gr. +/- 5% and with a clear visor. 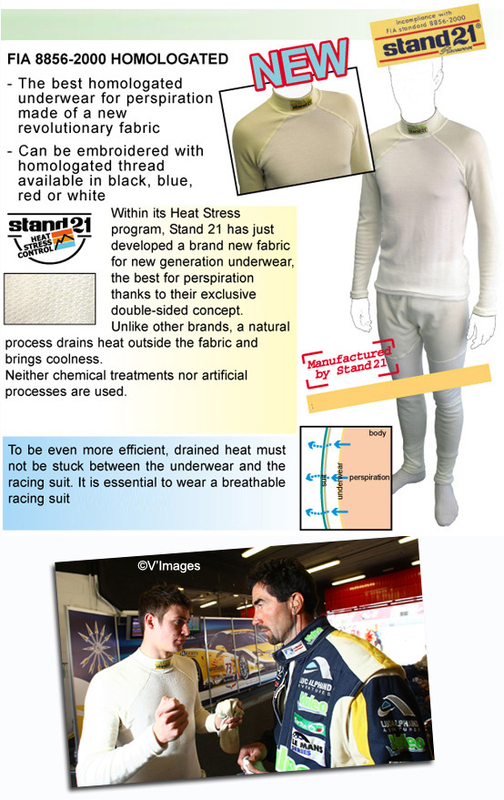 For years, Stand 21 has proven through reliable scientific and medical tests the need for the racing driver to wear airy and breathable equipments. In this area, ST3000 then Air Force racing suits became benchmarks immediately. However, for perspiration to be drained perfectly outside the racing suit, it must be drained through underwear first. That’s why Stand 21 presents today “Heat Stress Control” underwear which have already convinced our customers of the Endurance world (Luc Alphand Aventures for instance). 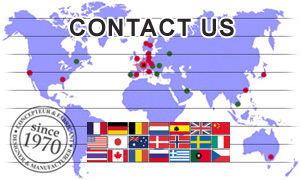 Check out now the missing link of our range of Heat Stress products. Heikki Kovalainen and Stéphane Ortelli’s unbelievable recent crashes have reminded us the giant step the coming of the HANS® took safety-wise. We remind you that Stand 21, one of the only two world licensees HANS®, which manufactures its own range, is developing a brand new model financially available to everyone with almost the same technical data of the top-of-the-range models. Be aware that a new HANS® tether system has now been created. Ideal for Rally or Raid drivers, the new FIA 8858-2002 et SFI 38.1 approved sliding tether allows you a greater freedom of movement in racing conditions while keeping the impressive and legendary efficiency of the HANS® system. You can adapt this new system to any previous HANS® generation thanks to a special kit sold 70 € inclusive of tax. Inform you now! 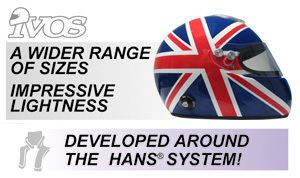 Note that the HANS® system is still being delivered with the traditional system of tethers adapted for open-wheels. However if you wish to have your HANS® delivered with the new system, indicate it to your Stand 21 advisor while ordering. A video showing how the system works is available here.